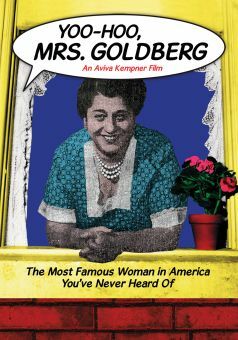 Gertrude Berg was, from the 1920s until the mid-'40s, the most prominent and successful female producer/writer/actress on radio and television, responsible for creating one of the earliest "franchise" series in electronic media, The Rise of the Goldbergs, later shortened to The Goldbergs. Berg was born Tilly Edelstein in New York City in 1898. The family originally had two children, of whom Tilly was the younger; her older brother died of diphtheria at a young age, an event from which Tilly's mother never recovered. Tilly's father opened a resort, Fleischmann's, in the Catskills. Tilly had aspired from an early age to a career on the stage, but her family had no way to get into the entertainment world. It was at Fleischmann's that she got her chance to work in entertainment. Starting at age 15, she wrote and rehearsed little playlets and sketches, which became ever more elaborate, and began devising characters on the page and the stage, based on who and what she knew from life in the Jewish section of East Harlem where she grew up. After finishing high school, she enrolled in Columbia University, where she studied playwriting. She later married Lewis Berg, and the couple left New York for a time to live in Louisiana, where Lewis landed a job in the research division of a sugar company. Tilly never gave up her desire to entertain, and when the family -- which soon included two children -- moved back to New York, she waited for her opportunity. She broke into radio as an actress, in a commercial for cookie mix in Yiddish -- which she didn't speak, but learned phonetically from her grandfather -- which proved so popular that she suddenly had a performing career. After that, she sold a few scripts on radio, and as early as 1928 started treading new thematic ground with what ended up as a one-shot show called "Effie And Laura," about a pair of working-class sales girls. Garry Marshall, born seven years later, obviously never heard "Effie And Laura," but that program eerily anticipated Laverne & Shirley 50 years later. In November 1929, she went on the air as the creator, writer, and producer of The Rise of the Goldbergs on NBC, in the role of family matriarch/host Molly Goldberg. Later shortened to The Goldbergs, the series became an instant hit as an island of genial urban ethnicity and warm family-based humor in a radio world dominated by most decidedly more middle American sensibilities. Strangely enough, it had never been her intention to portray Molly Goldberg -- she did it at the audition for the sake of expediency -- but network executives asked Berg to try doing it on the air, and their instincts were right. NBC was paying her the extraordinary sum of $2,000 a week, but really didn't discover how big a hit they had until a few weeks later, when a sore throat forced Gertrude Berg, as she billed herself professionally, to miss some episodes in her portrayal of family matriarch Molly Goldberg. The network received so many phone calls that the switchboard shut down, and over 100,000 letters came in. The Goldbergs, 15 minutes a day five days a week, ran on radio for the next 16 years until the end of 1945, switching networks to CBS midway through the run. In the course of the show's run on radio, Berg kept the humor level consistent, even as she included topical references to the worsening lot of Jews in Europe and anti-Semitism at home. The series' humor was accompanied by a message of hope and reassurance that transcended the setting and characters of the series itself. Immigrant families of all origins could identify with The Goldbergs, but middle American listeners also came to identify with and understand aspects of urban and Jewish life that had never before been presented on radio. For the 1933 episode coinciding with Passover, for example, Berg had a real rabbi officiate at a Seder, carrying the actual service on the air, this at a time when the airwaves were filled with anti-Semitism. And the reaction from out in the country was almost entirely positive. Berg became the Jewish community's de facto emissary to the rest of the nation. Polls from the mid-'30s placed her as the second most beloved woman in the United States after the president's wife, Eleanor Roosevelt. And there were commercial tie-ins with the series, including jigsaw puzzles, comic strips, and other products. And in the midst of the run, Gertrude Berg did a theatrical tour as Molly Goldberg that grossed $10,000 a week. The series lasted until late 1945, when it finally left he air. 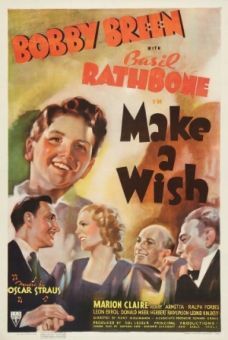 Berg did occasionally write for other shows and also authored one screenplay, for the 1937 Bobby Breen vehicle Make a Wish, co-starring Basil Rathbone. She was eager to try The Goldbergs in the new medium of television, and after some cajoling got an audition that led to a revival of the series in 1949, on CBS, as that network's first family sitcom. The show was so successful in its new incarnation that Paramount came knocking on the door with an offer to do a feature film, which was shot in the summer of 1950, entitled The Goldbergs (aka Molly). The year 1950, however, brought the first reversal of fortune to the series. A publication called Red Channels listed Berg's co-star, Phillip Loeb, who portrayed Molly's husband Jake, as a communist. Berg was able to resist the calls by her sponsor, General Foods, to fire Loeb, but only for a few months. The series was dropped and eventually Loeb was forced to take a buy-out of his contract. In the meantime, CBS had given the series' timeslot over to I Love Lucy. A bigger problem was finding a replacement for Loeb, which she only found two days before air time. Harold J. Stone became the new Jacob Goldberg, but his tenure with the show was an uneasy one, and he was eventually replaced by Robert H. Harris. The series continued until 1956, when it finally left the air. Berg wrote some scripts and acted for a few years. She wanted to revive The Goldbergs, but none of the networks or sponsors were interested. 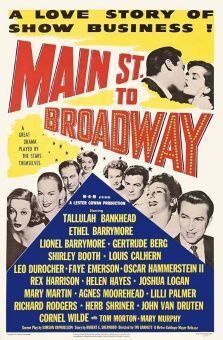 At the end of the 1950s, however, she went on the Broadway stage in the play A Majority of One, working opposite Cedric Hardwicke, and won a Tony Award. The role for the movie version went to Rosalind Russell, but the point was made: Gertrude Berg was more than a one-trick pony. She was cast with Hardwicke in a television series, The Gertrude Berg Show, which didn't last. And she never stopped trying to bring back The Goldbergs. Berg passed away in 1966 of heart failure.